Last week, I discussed how to find that "perfect" guild. You followed the tips and found yourself a wonderful place to hang your hat. The people were friendly and you got to see what you wanted to see, based on what you decided were the things in the game that meant the most to you, like, maybe, killing giant spiders. But, after days, weeks, months or even years, what you want out of the game changes. Maybe you can play longer hours now so you'd like to give progression or hard-core raiding a try. Maybe you just can't play even the 4 hours per week you started out with and need to stop playing altogether. Maybe the guild climate has changed. Whatever the reason, you've decided a change of scenery or tabard is what you need. Let's talk about how to leave in the best possible fashion. First of all, how do you know it's time to leave. It can be hard to make that decision particularly when you've been with a guild for years. If your guild has a casual focus and you find you have a great rush of adrenalin when forced to produce a certain amount of heals or damage per second, you might feel constrained with a slower pace. If you find yourself parsing logs for what you do after every raid and you're reading about character optimization, you might like a more progression focused guild. 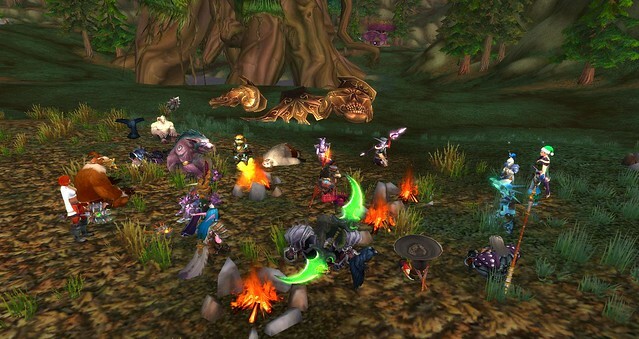 If you started your tenure with your guild by having 6 hours per week to play and now find that real life only allows you 3 hours per week, maybe the kind thing to do is to leave a guild that is more interested in raiding and go to a slower paced guild. Or, perhaps the game holds no interest for you or those 3 hours find you frustrated by what you can't get done. You might benefit from stepping completely away, breathing, living and seeing if the game is where you want to spend your free time. In addition to your evolution as a player, guilds evolve. 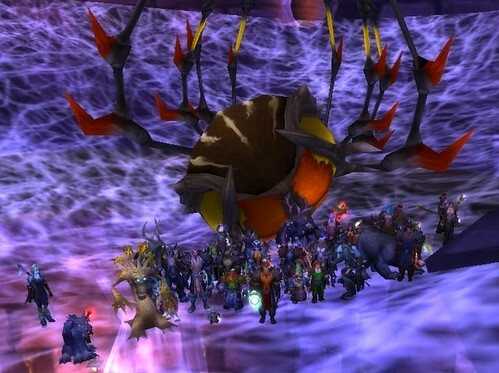 I know of casual guilds that morphed into progression and then hard-core raiding guilds. I also know of guilds that went the other direction because it was too stressful to maintain the high focus of progression. And, sometimes guilds just implode and the atmosphere can only be described as "toxic". May you never experience that, but it happens and you'll know when it does. All of these cases and varying degrees of them might cause you to want to leave. If you feel let down or have a conflict with someone or dislike the nature of the guild, the human desire is to "tell it like it is", let "them" (whomever you identify with that pronoun) know how unhappy you are. That is the worst thing you can do. Even in a guild filled with drama, adding to it will not help anyone. The Welsh poet Dylan Thomas may have said, "Do not go gentle into that good night. Rage, rage against the dying of the light", but throwing a fit brands you as a drama creator. If you stay on the server where your former guild is located, word gets around. Even if you thought you had formed a wonderful friendship with "C", a drama-filled guild exit can quickly leave you isolated. "C" doesn't need that in her life. Even if your cause is righteous, such as the guild leader only raids his family, don't scream at him. Don't post to your server forum that you're looking for a new guild while you're in your current guild. Guild leaders read the forums, or any guild leader with any smarts does. The last thing they want to see is your name with a "Hey, I'm looking for a new guild" post. Your current guild expects you will be a team player. If you're posting to the server forum that you're looking, you'll be guildless faster than you expected and you'll find out that "C", whom you thought was a friend, isn't interested in someone who goes behind the guild's back. Don't not talk to someone and just up and leave. You might think you're avoiding drama, but guilds are going to know when you're not logging on. If you happen to be on some people's friends list, they are going to wonder why you're online but not in the guild. Follow these tips for a seamless departure. First of all, decide why you want to leave. If it's simply that your wants from the game have changed, hurrah for you. Better to find some place that fits your wants. If it's a personality problem or a perceived change of tone in the guild, can it be solved by talking with an officer? Second, and I believe this is the number one priority for someone leaving a guild, tell an officer you're leaving. You don't have to write a long involved note. A simple, "Hey, it's been fun, but I've been accepted into a progression raiding guild so I'm going to be raiding with them." Your fellow guild members and your officers will thank you. "Well, I didn't want to cause drama," you might say. Leaving without talking to anyone in the officer corps causes drama and leaves a bad taste in everyone's mouth. Your alts, if you have them, could find themselves guildless. What if the guild situation is untenable and telling someone will just make it worse? I still believe you need to send an in-game letter to an officer or the guild leader stating simply, "Hi, while I've enjoyed my time here, my game wants have changed and I've found a guild that better meets my needs. I wish all of you the best." You might be lying through your teeth but a letter with "You're all a bunch of steaming sacks of talbuk doo doo" won't win you any friends. In the age of instant communications, you could find your letter going viral for all the wrong reasons. If you are leaving because your wants have changed and you have a reasonably good relationship with your guild mates, a paragraph in your guild's forum explaining why you're leaving is a very good thing to do. You'll find that people don't hold it against you if you're up front about leaving to do something else. They will probably wish you a lot of luck and encourage you to stay in touch. Even if you're leaving because the guild climate is "toxic" to you, a polite "I'm leaving to pursue other avenues" let's you leave with somewhat good feelings from the general membership. When should you leave? I think that's a very subjective thing. If you're leaving to pursue other avenues in the game, have explained things to your officers, have penned a "thanks, but I'm leaving" letter and people are wishing you well, leaving during a time when a lot of people can say their "Good byes" is not a bad idea. Everyone comes away with "warm fuzzies" and you look respectful of everyone. If your leaving is because of drama or if you think it will cause drama regardless of doing the above suggestions, then it is probably best to leave at a time when there are few people online. If there are people online when you decide to /gquit, don't burn your bridges, so to speak, by calling out someone or some group of someones as you leave. "I'm going to pursue other avenues. Thanks for all the fun," is all you need to say. Your letter of goodbye to an officer and/or the guild leader can be penned at that time, as well. Guilds become families, particularly if you hang around for a long time. You know someone's pet, their hometown, their favorite food, their dislike of asparagus. Understand that leaving is bound to cause sadness, anger in some cases. We're human and we can take some things very personally, even when they aren't meant that way. If you leave with tact, even if the guild doesn't deserve that tact, you'll feel better about cutting the cord and moving on.